The celebration continues for the launch Genesis’s latest sports sedan. We’re thrilled to say that the G70 is MotorTrend’s 2019 Car of the Year®. And even more excited to know that the journey is just getting started. Based on two essential criteria by IIHS: how well a vehicle protects its occupants in the unfortunate event of a crash, and technology that can prevent a crash or lessen its severity. We are pleased to announce that the 2019 G70 also excels in these areas and has been named an IIHS Top Safety Pick+* when equipped with optional LED headlights with Dynamic Bending Lights. The sound of its inspiring exhaust note hints at the G70’s impressive performance credentials. The available 3.3L, 365-horsepower twin turbo paired with launch control pushes the G70 to a quick, confident jump off the line. The sophisticated all-wheel-drive system works in sync with Dynamic Torque Vectoring Control to deliver enhanced stability and quicker response on slippery roads. An extraordinarily tight, responsive ride is the result of a more rigid frame, an exceptionally low center of gravity and electronically controlled sports suspension. The superior stopping power of available Brembo® brakes provides a heightened sense of confidence and security. Designed to make an instant and undeniable statement, the G70’s exceptionally low center of gravity creates a wide, dramatic stance. The sleek profile follows through, creating a powerful visual momentum drawing your eye from the aggressive crosshatched grille to the available sporty dual exhaust tips. The G70’s striking, aggressive front end is highlighted by the signature crosshatch hexagonal grille, available finished in arresting dark chrome. The rush of glimpsing the G70’s exterior is equaled only by the exhilaration of taking a seat in its equally stunning cockpit. Surrounded by sporty details, exquisite materials, cutting-edge screens, and intuitive controls, every element works in unison to put you in full command of every moment. The driver-centric cabin experience is enhanced by available Nappa leather seats, adorned with a unique diamond quilting pattern, a striking feature further highlighted with available contrast stitching. You’re fully in sync with your vehicle thanks to advanced, fully integrated technologies including available Heads-up Display, a Surround View Monitor and large screen navigation. Safety and awareness are enhanced, leaving you completely connected to both the G70 and the surrounding world. You’re fully in sync with your vehicle thanks to advanced, fully integrated technologies including available Heads-up Display, a Surround View Monitor and large screen navigation. Safety and awareness are enhanced, leaving you completely connected to both the G70 and the surrounding world. The G70’s Surrounded View Monitor gives you a full 360º view around the vehicle, keeping you aware of normally unseen surroundings, assisting with parking and helping you keep clear of external objects. Proving that performance goes beyond horsepower, the G70 offers advanced tech to anticipate and meet your every need. Available features like a wireless charging pad, Lexicon® Premium Audio System and hands-free smart trunk, elevate the focus on your comfort and convenience to the next level. 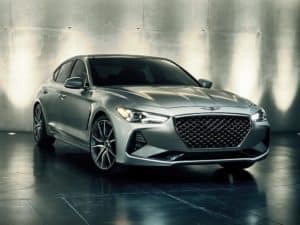 In truest Genesis fashion, all of our most advanced safety features and technology, like Forward Collision-Avoidance Assist with Pedestrian Detection, are standard. Because there is simply nothing more important than you, your passengers, and those around you. Looking out not just for you and your passengers, but those around your G70, Forward Collision-Avoidance Assist with Pedestrian Detection* can detect slower or stopped vehicles ahead, as well as pedestrians and bicycles. To help keep you in tune with the flow of traffic, Smart Cruise Control’s front-mounted radar sensor* detects the distance to the car ahead, automatically maintaining your distance and speed from that vehicle. Even after a full stop, speed and distance control is re-engaged when the car ahead starts moving again. Blind Spot Collision Warning* alerts you when it senses vehicles in your blind spot or approaching at high speed from behind. Rear Cross-traffic Warning helps warn you of vehicles approaching from the rear sides. To celebrate its unprecedented introduction, the G70 will be offered in two very special limited editions of only 400 vehicles each. The sporty, performance-oriented Dynamic Edition and the aggressively stylish Design Edition. True luxury is about the complete experience. Designed around real needs and wants, respecting how you actually live. This is the Genesis Experience, a thoughtfully crafted suite of owner benefits. Have a look at our selection of Genesis vehicles by clicking here!